I am a freelance writer and blogger for Pink Play Magazine. Here you will find links to my published works, online publications, blogs, creative projects, events and the newly launched podcast Fashioning Families. Currently I host my personal blog Brave.Creative.Me here. 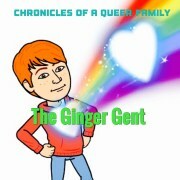 I also write the PinkPlayMags Queer Parenting Blog The Ginger Gentleman. I am also published is in The Annual Her Heart Poetry Anthology. They feature two of my poems. One entitled Still With Me written for my late wife, and Let It Go written for my son. Purchase a digital or hard copy here.